The quality of the air inside your home directly affects your health. Living in an environment with poor indoor air quality can cause both immediate and long-term illnesses. Here are some reasons your HVAC system could be the culprit – and what to do about it! Just like you regularly take your car for a tune-up, you should regularly schedule a tune-up for your HVAC system. Regular tune-ups can double the life of your heating and air system and save you thousands of dollars. A complete system tune-up – done once a year for newer homes and twice a year for older homes – can help prevent costly breakdowns and increase the longevity of your heating and cooling system. Sometimes it's not easy to tell if it's time to replace your filter. Hold it up to bright light. If you can't see the light shining through it, it's time for a new filter. To help you remember this maintenance task, place a reminder on your calendar or cell phone. Or link it with another household task, such as paying your monthly gas bill. You should change your air filters once a month, especially if someone in your home suffers from breathing difficulties, you have furry pets, you regularly spray chemicals into the air or work with paint, if someone in your home smokes or a remodeling project has generated a lot of dust. To remove allergens from your indoor air, choose a high-energy particulate air filters, more commonly known as HEPA filters. These are the best HVAC filters for allergies. Made from layers of glass fibers formed into pleated paper-like material, HEPA filters trap more than 99 percent of pollen, dust and smoke. In addition to dust and dirt, a filter traps irritants and allergens such as dust mites, pet dander, and pollen so that they don't enter your ducts, flow into your home and infiltrate the air you breathe. Mold can thrive within different areas of your HVAC unit that are prone to humidity and moisture. These include the drip pan, evaporator coils, and within air ducts. If mold is circulated from other parts of your home by way of the duct system, the fungus spores will enter the nose and lungs, presenting symptoms that resemble hay fever. An HVAC technician can inspect your system for mold. Low humidity in your home means less moisture, and that is very important to hindering mold growth. Running your air conditioning instead of opening windows, reduces the humidity level in your home. You can also install a dehumidifier in your home to help. We can bring allergens into our homes in a variety of ways – on our shoes, clothing, pet’s hair, opening windows, and inviting visitors over, just to name a few. In addition to maintaining your system, using a high-quality air purifier and cleaning your home regularly can also help alleviate your indoor space of allergens. The health and well-being of your HVAC system is inherently tied to yours. 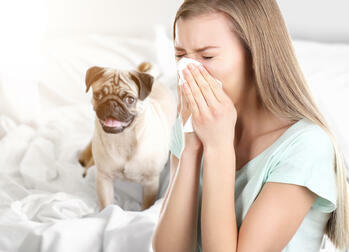 Take care of it and you're likely to breathe healthier indoor air. And that, in turn, will provide some relief for your allergy symptoms.